We've seen some lovely buildings and houses come down while we've lived here. 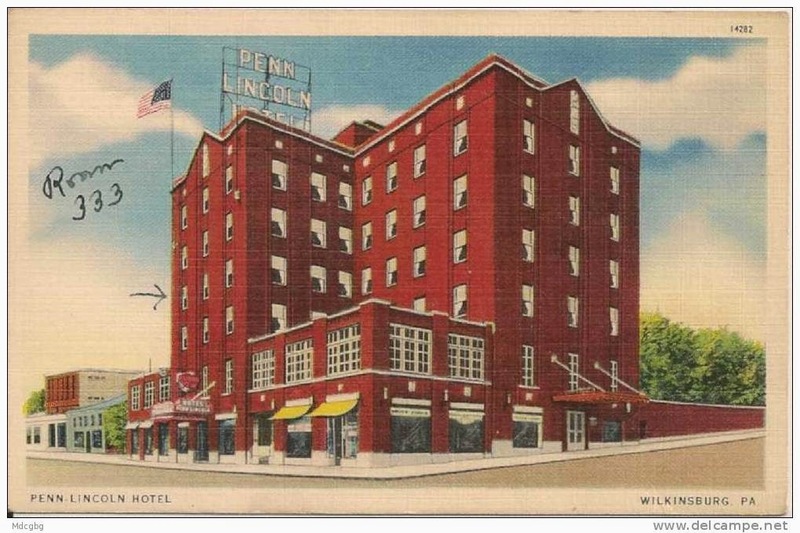 It turns out another one I pass all the time is about to join their ranks - the 1927 Penn Lincoln Hotel in Wilkinsburg PA. Sooo terribly sad. At least it's being salvaged, but gee I wish I knew what happened to the Samual Yellin gas lights! In a few weeks the former Penn Lincoln Hotel Building on Penn Avenue in Wilkinsburg will be demolished. PHLF was among a group that made concerted efforts on various occasions to try and save and restore the building, but costs, coupled with a lack of market and the building’s deteriorating condition, resulted in this decision. The downward spiral started many years ago when the hotel closed. In its heyday, the hotel served guests who disembarked from the Pennsylvania Railroad when it stopped at the former Wilkinsburg Railroad Station on runs between New York and Chicago. State Route 30—the Lincoln Highway—followed Penn Avenue connecting Pittsburgh and New York by motorcar. The Penn-Lincoln Hotel sat at the junction of these two important early transportation routes. Architectural Historian Jamie Van Trump called Benno Janssen (1874-1964), the architect of the Penn-Lincoln, “the most talented of Pittsburgh eclectic architects of the earlier twentieth century.” The Kaufmann’s Department Store addition at Fifth and Smithfield, the William Penn Hotel, the E. J. Kaufmann house in Fox Chapel, and the Mellon Institute are among his many distinguished buildings. Janssen designed five hotel buildings between 1909 and 1929. The Penn-Lincoln (1926-27) was a six-story brick building that advertised itself as “Pittsburgh’s Most Modern Suburban Hotel.” The simple facade was enlivened with 12 outside iron lamps designed by acclaimed metalsmith Samuel Yellin of Philadelphia (the lamps are gone but blueprints are on file in the Yellin Collection at the University of Pennsylvania Architectural Archives); cast ornaments of cupids, ram’s heads, and rampant lions remain on the facade. For some years, the former hotel served as an apartment building, but it could not be well maintained. A partnership consisting of Deliverance, Inc., a faith-based group led by Reverend Michael Golphin, eventually acquired the building and PHLF loaned $135,000 to Deliverance to begin development of the property, but costs were too great. Allegheny County then contracted with our organization to analyze restoration costs and possible uses for the building. But because the building had deteriorated, bricks were beginning to fall, environmental remediation proved to be expensive, and the reconstruction costs were very high. 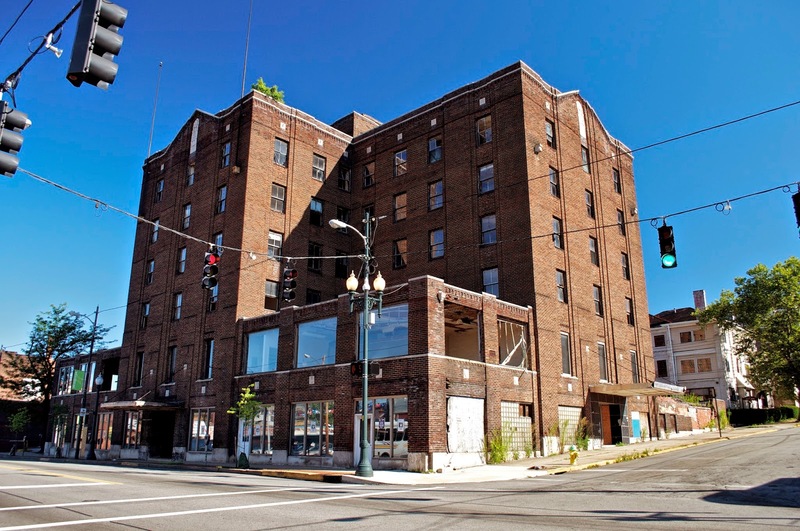 What is more, we could not find a market for the redevelopment of the building in the Wilkinsburg area even though we considered various forms of housing, retail, offices, mixed use, and single use. Ultimately, everyone concerned agreed that the building had dangerously deteriorated and public officials in Wilkinsburg, the community, members of the Community Development Corporation, our organization, and the County agreed there was no restoration solution. However, all parties will work together to rebuild this strategic corner with a new building in scale and design that will enhance the historic Penn Avenue Main Street. We are trying to secure an anchor tenant now. Adjacent parking will be available. As part of the mitigation for the removal of the building, many of the sculptural artifacts embedded in the structure will be saved and relocated to public parks and community gardens in Wilkinsburg. In addition we are preparing a nomination of the Penn Avenue-Wood Street business area for addition as a historic district to the National Register of Historic Places. The Wilkinsburg CDC, under Tracy Evans’ leadership, has been achieving good results with the Main Street businesses and historic buildings, and our organizations, together with Allegheny County, are seeking funds to begin a clean up and undertake exterior restoration of the former Wilkinsburg Railroad Station. We hope we will have positive news to report later this year. It’s sad that the historical building will soon be demolished. Personally, I’m all for the conservation of all such legendary structures that make up a significant portion of our architectural legacy. However, there is hardly anything that can be done in order to protect buildings that are hazardously deteriorated and have negligible scope for maintenance. The only way out in that case is to tear them down and rebuild. In this case there isn't much to save other than the shell itself. There have been many efforts over the years to find a use for the building, all of which have failed. But it'll be a huge loss to the historic streetscape of Wilkinsburg.